Wicked Voodoo Espresso (LLC) is a coffee company that provides gourmet, high-quality espresso drinks, Voodoo donuts, and authentic German pastries to customers. 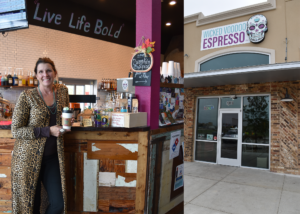 Laurel and Kenny Winslow opened Wicked Voodoo Espresso in New Braunfels November of 2016 in a drive-thru kiosk. Three years later and they have expanded beyond the drive-thru with a brick-and-mortar coffeehouse, a distribution center, a commercial kitchen and they are selling their products in 10 stores. You can find Wicked Voodoo Espresso at wickedvoodooespresso.com and in person at their Freiheit Village Location, 2154 Gabriels Place, New Braunfels, or their coffee stand next to Beyond Blessed, 513 Business I-35 South, New Braunfels. Laurel received UTSA SBDC client assistance from the New Braunfels Satellite Office and business advisor Larry New. Together they discussed coffee bean wholesaling, warehouse space in Seguin, and managing warehouse space for other businesses as additional revenue. They also discussed working with PTAC in UTSA’s Institute for Economic Development and how they could help in getting Laurel certified as a woman-owned business in order to engage in business with Dell, Samsung, Princess Cruise Lines and others. With the business expansion and an owner-investment of $250,000 they created 6 new jobs, retained 6 jobs and they expect $750,000 in increased revenue with the new brick-and-mortar location.